The Moon - exalted in Taurus, rules over Monday. The Moon is represented by Diana, the hunter Goddess. It is associated with the emotional aspects of a person; unconscious thoughts, memories and moods, but also with our maternal instincts, nurturing, home, security and past experiences of individuals. As well as the planet Mercury, The Moon rules the spirits of animals. 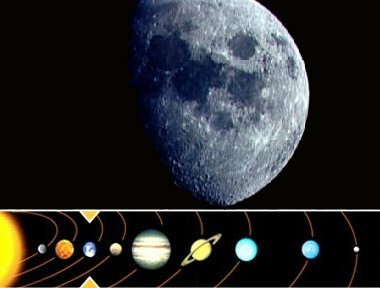 The Moon is the only astrological planet that can be seen to change on a daily basis. These rapid changes can widely affect our lives, especially when The Moon is rising in our sign. Care must be taken at those times to make sure changes are led by us and not by too many external factors. The Moon is the ruler of the fourth house and of Cancer. Those with The Moon in Aries have a fiery spirit. They are brave, care free, they love and crave freedom. They might appear blunt to others but they are honest and not afraid to speak their minds. They often jump the gun always looking for the next challenge. The last thing they want is restrictions and boundaries. The Moon in Taurus makes these people want to take charge and be in control. They are honest and steadfast and will seldom take no for an answer. They love their luxuries but also have a good head on their shoulders knowing how hard they have to work for the finer things in life. They are good people to turn to in advice but also know when they are being taken advantage of. Those with The Moon in Gemini are lively, humorous and sociable. They are always on the go and can sometimes find it hard to relax and unwind. They are nearly always full of new ideas and full of almost childlike enthusiasm. Others may be slightly overwhelmed by the hectic lifestyle of Gemini. Yet The Moon is what makes Gemini adaptable and flexible to in almost any situation. Those with The Moon in Cancer are always thoughtful and feel with great depth. They are very considerate and loving towards their nearest and dearest but once hurt they will hold onto their grievances for a long time. They can be demanding but this could be due to their vulnerability. They will want to protect themselves no matter the cost. Highly sensitive they will run a mile if they feel any sort of rejection. They just need security to make them content in life. Those with The Moon in Leo are bright and optimistic. They usually see the best side of everything and everyone. They are born leaders and others usually see them as an inspiration. They are confident in their own abilities and will encourage others to show their talents, they are highly enthusiastic in many tasks that are set before them. They are full of bravado but have an almost childlike trust and can be easily hurt. Those with The Moon in Virgo tend to be highly disciplined. They believe in strict routine and consistency. The Moon in Virgo may make them appear cold and aloof but really they are just analysing and thinking how they may be able to make improvements on something they feel is imperfect. They can discriminate and also what others may see have unfair criticism but Virgo also have the ability to work out any differences of opinion in themselves and in others in a practical manner. Those with The Moon in Libra know how to create a harmonious balance in their home life and personal relationships. They have high standards and ideals but are also willing to compromise to make for a more peaceful life. They are fair and trustworthy. With the air sign inhabiting The Moon they tend to rule with their heads rather than their hearts. They seek perfection in themselves and in others around them. Those with The Moon in Scorpio may appear very calm and collected on the surface but underneath they are brimming with intense emotions. They are deeply passionate and emotional but will work hard to contain these emotions. A Scorpio under the influence of The Moon will often surprise you with sudden outbursts. They can also have deep seated feelings of jealousy and resentment. But it is possible to built up mutual trust and Scorpio are also compassionate and faithful as long as you don't betray them. The Moon in Sagittarius makes those strong pioneers, they strive to be first and foremost in almost anything. They are ambitious and proud of their achievements and won't allow anything to hold them back. They have an onward drive to push ahead, searching for the unexplored and new. They are quick witted and sharp and can hold themselves in public. They are curious. Others may see them as somewhat reckless and foolhardy but they have a strong focus on the future and will concentrate on making it a better one for themselves and close ones. Those with The Moon in Capricorn are emotionally intense. They see a goal and will strive towards it dogmatically not allowing anything or anyone to get in their way. They tend to be high achievers in life because of this. They will only become close to those they have learnt to trust and only then they will become the most faithful and loyal companions. They dislike being idle. Those with The Moon in Aquarius can make them appear cool and aloof. They may seem emotionally detached to other people and situations but what they are actually doing is assessing the situation. They may not even understand their own feelings but they are highly imaginative and will explore new ideas. They usually have a wide circle of friends but only one or two very close friends. They have a strong urge for personal freedom which usually makes it difficult to tie them down. Those with The Moon in Pisces are highly emotional. They can pick up someone's emotions that nobody else can sense. They almost have an psychic ability to sense another persons thoughts and feelings. They are very sensitive and also caring towards others always helping those in need and vulnerable. They are empathic. They are also romantic and know how to rekindle a dying relationship, Their downfall is that they tend to live in a dreamlike state refusing to see the bad in anyone and have a tendency to bury their head in the sand.